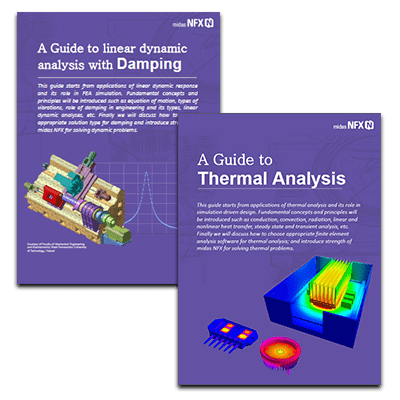 Modal analysis is, along with linear static analysis, one of the 2 most common types of FE analysis. 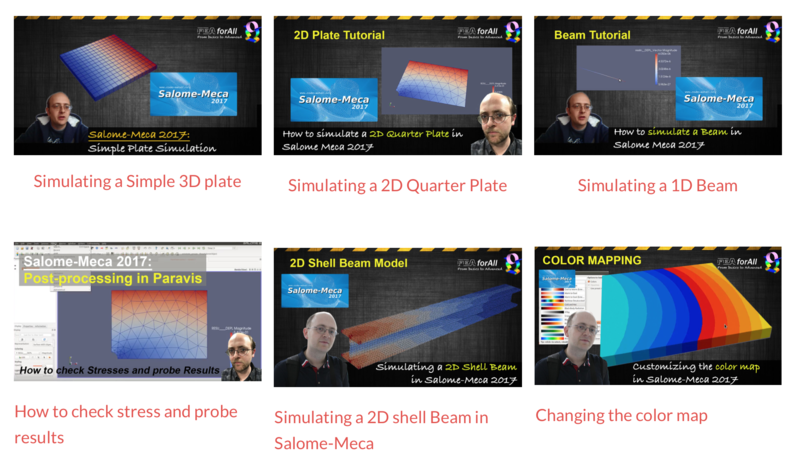 If you don’t know about those, you’ll have to review your fea basics. That’s what we’ll do here! Static analysis means that we are making the assumption that the system we are simulating doesn’t depend on time. Whatever the time period we observe the system, it will remain always the same. It implies of course that the loads and boundary conditions don’t depend on time either. To take that in account, in static analysis, we just say that the load is applied « infinitely slowly » so there is no discontinuity during the load application. There are cases in which the loading itself (or the system) is dynamic and thus we have to perform a dynamic analysis. If you want to analyze an object falling on the ground, this is an impact… you understand intuitively that the reaction of the floor will first not apply when the object is in the air and AS SOON AS the object touches the ground, the reaction of the ground suddenly applies and impact the object. The application of the load is short AND intense. This type of phenomenon is 100% dynamic. Dynamic Loadings can have various temporal distributions and it definitely has an impact on the system. In static analysis, the system and the boundary conditions don’t depend on time. What matters is the intensity of the load. In dynamic analysis, there is a time dependency. What matters is the intensity of the load AND the temporal distribution of the loading. I think that this is generally understood, but a short reminder is always good. Cyclic loads have a certain frequency, period and intensity. Cyclic loadings are transient loads. If you want to understand more about transient and steady-state and really understand the difference, I wrote another article about the topic in the past here. Consider a kid on a swing. The swing is the mechanical system and the kid provides a forced excitation input. If the kid’s excitation load has a frequency which becomes close to the swing’s natural frequency, the swing goes up and up and the oscillations increase. This phenomenon is called « resonance ». The same can happen for any mechanical system that oscillates or vibrates. Resonance can be dangerous… and in case you don’t know… bridges have broken like that in the past because the frequency of the wind was matching the natural frequency of the bridge! It happens when the system enters in « resonance » with the frequency of the input loading. When the frequency of the input load is equal to the « resonance » frequency of the system. So what is modal analysis?? To explain it simply, modal analysis is a simple way to calculate the natural frequencies of your system so you know which frequencies can be destructive and dangerous for it. Why there is no load in a modal analysis? Modal analysis calculates the natural frequencies of the system alone. Modal is the simplest analysis and the only thing it does is telling you what are the “resonance frequencies” of your geometry. It isn’t related to a loading at this stage, only to the geometry. Resonance frequencies change due to the shape of your model and the way it is constrained only. What is the input I need to provide for the EIGL Card? Do you like this article? Leave a comment and let me know! And my operating frequency is say 20 Hz. Will the resonance will be creating??? If it so then why do we are extrating more than one natural frequences. Hi Vishnu, you are right… the closer you get to the natural frequency, the stronger will be the response. To know exactly what will be the response, you have to perform a frequency response analysis. Then you will be able to observe and measure the actual response of the system. WHAT DO YOU MEAN BY NATURAL FREQUENCY OF A BUILDING STRUCTURE? Like I am describing in the article, each system has natural vibration frequencies…and it includes structures like buildings as well. Thanks for the article, it was very much informative. In continuation to vishnu’s question, If my operating frequency and natural frequency matches, I believe I will have to vary the natural frequency of the system. In that case, which way should I working towards? (Increase or Decrease). Depends on your system, some system vibrate in low frequency range (for exemple < 50 Hz) and others vibrate at much higher frequencies. You have to choose a span of frequencies which corresponds to the possible vibration range of your system. The displacements and stresses obtain from model analysis are not realastic. Is it so?? That’s right. Modal analysis doesn’t provide you with this information. It only gives you the mode frequencies and the mode shapes. I am totally confuse with mode shape. What exactly meaning of “mode shape”? At a certain frequency of vibration, your model vibrates in a certain way…at another frequency, it may vibrate too but not in the same way. The mode shape is the hypothetical deformation described by your model at a certain frequency. It is not a real deformation, it is just an idea of how the model would deform while it vibrates at the specific frequency you are looking at. it says that, If external excitation or alternating load is applied at 30Hz, along y axis , resonance will occur. How find the vibration velocity (mm/s) of a shatf rotating mixer model? What do you mean by “Vibration velocity” Samir? Thank you for your the in depth explanation. Simplest solution is the best! Thanks for your efforts in writing the article. I enjoyed reading it. Every time I read a technical article use to learn something new which I was not aware before, this became true for your article too. I think that Natural frequencies and Resonance Frequency should be used in different context. Natural frequency is PURELY a structural behavior it’s function of stiffness and mass distribution or in other words function of geometry and support conditions. Loading has no role to play. If the structure resonate at a particular natural frequency then that frequency is called resonance frequency. A structure can have multiple natural frequencies and their corresponding mode shapes but the structure is not going to resonate at all these natural frequencies. When a natural frequency becomes a resonance frequency depends on the how the external loading ( direction and distribution to excite one or more natural frequencies) is acting on the structure and hence it’s function of loading too. Though there has been attempts in this article to explain the difference between these two, I think that at some places they are used interchangeably. This shall give a room at some beginner mind to think that they are both one and the same. I learned this from my technical boss after many years of praticing experience. So in my humble opinion Model analysis mostly the termm Natural frequencies should be used and perhaps at very few places the terms Resonance frequencies can be used to explain when a natural frequency can be called as resonance frequency. Thanks for your long and interesting comment! You are right :) I kind of simplified a bit the phenomenon to make it better understandable for beginners. There is for sure more to say about it if you want to be rigorous :-) Thanks again for taking the time to explain your thinking! After multiple years of experience I could easily say it is static analysis which really solves my problem and make me understand deeply what happening in my system. For example I take example from your article above…you mentioned impact of ball on ground. In my personal view dynamic analysis is all about to understand and debate about that critical moment when ball going to hit ground…I mean here that particular moment from whole dynamic analysis is important for me and knowing about what exactly happen to my ball at that time for example if I interested in loads coming on ball. That’s it……. Pl tolerate me guysss because I want to be knowingly ignorant about complex maths people many time confuse me rather talking about solution to engineering.. Thank you very much Manoj for your impressive comment and also for sharing your experience here on this article. I believe that sharing experience between engineer is necessary to make progress in this world and I am grateful that you took the time to write your view of the topic. I think you can also use the eigenmodes for really lightweight analysis. I mean that once you have the frequency response, you can extract a few of the most significant resonance frequencies (say 3 of them). You can then use those 3 modes to approximate the system response to arbitrary loading. Thanks for your valuable share Cyprien. 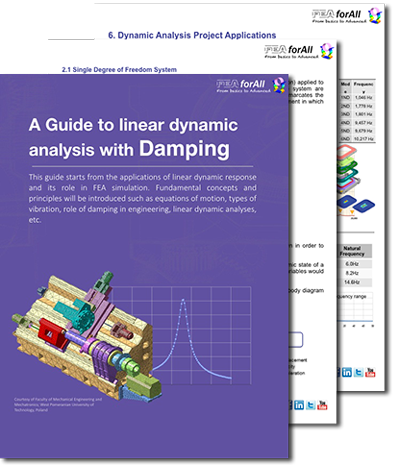 Have you ever shared any tutorial about rotor dynamics (undamped critical speed analysis, unbalance response analysis, damped eigenvalue analysis and stability analysis)? If not, can you share? Great Article on Modal Analysis. Thank you for that. Can you write a article on Campbell diagram, which will be plotted once we get the natural frequencies of the system from modal analysis ? I wanted to know difference in modal analysis with constraints and without constraints to understand the natural frequency of the system. Suppose I have a fixture being mounted on vibration shaker. I can do a modal analysis of it with no constraints and other one with constraints at the mounting locations. In without constraint case, we get first 6 rigid modes and then actual mode shapes and same is not the case with constraint one. I have tried both but differences in natural frequency due to boundary condition, which is more useful to avoid the resonance phenomena. It seems that the constraint one depicts the actual physical thing and no constraint case is generally used as free-free run. Kindlyl let me know about this. Hi Gopal, You’re perfectly right! Good luck with your analysis. I am thinking on this…You do onething next week first thing of your day…open same assembly which was not constrained …in your assembly select any one component which u like most and make loose connection to rest of assembly….now run your modal analysis…pl tell us how many rigid nodes u see in FEA results??? If you see rigid modes more than 6…then it means by running modal analysis you can also find out how many components in ur assembly loosely connected…..
for sinusoidal loading , the knowledge of natural frequencies is must, but what about random loading? how we can predict which mode is dangerous(coz all the frequencies are present all the time). Does mode shape also gives some information,means can we say that this shape can be dangerous? For random frequency loading, there is a special type of analysis to analyze it called “Random frequency response”. It works basically like a frequency response analysis but with a certain type of random input defined by a certain spectrum distribution that you can define. I am seeing a very nice explanation of Modal analysis. I am analyzing an ultrasonic horn whose one face is attached with a vertical rotating tool, while other face is attached with transducer. Now pls tell me should i fix the horn from transducer side for modal analysis, leaving free at rotating tool side. and what i do for harmonic study. 2. To compare real physical condition with ur software bounadry conditions. Example a simple beam both end fixed and you applied vertical load…after running simulation…you should expect displacement/deformation of beam should be downward and no rotation should be at ends…….in case you animation in post shows something diffrently …..which means There is something wrong in your boundary condition…keep correcting your boundary conditions untill you donot see what u wanted to see in post processor…once u happy with ur animations in ur post processor…u win half racee..
3. Also please keep checking reactions and moments looking good..
Just a thought ….May be I am wrong…pl make your own informed decision based on system u seeing in front of ur eyes..
1) Which one should be considered either Free-Free Modal analysis or Constrained modal analysis and Why ? 2) What do you mean by mass participation factor in Modal analysis? I have a question, how many vibration modes is recommended to calculate for a convencional study? What is important is to be able to find the main modes that will impact your specific analysis. More you have modes and more you will have chances that the important modes for you are included inside, but you still have to find which ones. That’s why modal analysis is almost always coupled with another type of analysis such as frequency or time response. Just make sure you have enough modes so that 90 % of effective mass is considered in all direction. Output file will help you to find that. Number of modes to be extracted depends on external excitation frequency if the excitation is harmonic in nature. If you are doing seismic or random vibration analysis you need to make sure that effective mass of the extracted modes is more than 85-90 % of the total mass. Nice answer….. i have one question regarding connecting rod modal analysis in ANSYS, it shows 6 different modes at result. i dont know what is that ? in static structural analysis if we apply a load to connecting rod its shows von mises stress in result , if von mises exceeds the yeild stress of a metal then we can conform it gonna fail. like this in modal analysis it is possible compare answer results in ansys software with theoretical result ? if so please reply? By default the modal analysis is just for linear systems. So how could one find the natural frequencies of nonlinear systems (for example s structure with nonlinear boundary conditions) by the tools of a FEA software? Thanks sir your all lecturers are very much useful for us. Very nice article for beginners to understand the general followed process in design department for automobile products. I’m trying to follow your tutorial and have a problem in setting output results. In Output definition Card when choosing Results>>Results there is a and I can’t specify anywhere this object so i can’t finish analysis properly. Do You have any idea where the problem could be? Not sure I understand your question. Is your problem to view the results in Paravis because they do not appear? Or is it something else? I think this is the cause I can’t carry out analysis properly. I’ve recently had to deal with some FEA related stuff at work and I’m a lay man when it comes to it. The concept here was explained in a very simple and easy to understand manner even for someone like me. So thanks a lot for this article! You’re welcome Anirudth, I am glad that it was useful to you and help you in your job! Thanks for reading the blog. Article was good sir. Can you explain how ansys calculate the modal frequency with given input . I have started my career on modal analysis. I understand the resonance procicples but the thing that confuses me is the input frequency. What is the input frequency of loading? If you are talking about modal analysis, the frequency input you need to give is different, it is just a “range” in which you tell the software you want to search frequencies. The software only does what you tell him… and frequency are infinite so you want to search for a specific “area of frequencies” in which you know you will find some natural modes. I wanted to know how to identify the local and the global modes from a modal analysis obtained over a range of frequencies. I have done modal analysis of a structure with on boundary conditions , thus I get first 6 rigid body modes which have zero frequencies. Now starting from the 7th mode, the frequency rises. I want to know how to locate the global mode shape starting from 7th frequency. Hi Gopal, to identify the response of each mode and the exact displacement induced by them, you have to constraint and load you model with a frequency dependent load and then do a “frequency response analysis” (make only sure that the range of frequencies you will sweep will contain the modal frequencies you are interested to see). I have another post on the blog explaining in details about frequency response analysis, check it out here. Thank you, that really helps a lot. Im working with midasnfx and i have a question about one type of analysis case. I already did a “Linear Static”, “Modal” and “Response spectrum” analysis and now im wondering if its possible to define a case with RS + Static Load? Also is it possible create an acceleration/time function for define a new RS? I am not really sure about what you want to do here… are you trying to apply a static load and trying to get simulate it dynamically by adding a tie function? (In which case you should use a transient response analysis) or do you want to combine separately the results of a RS analysis AND the results of a linear static analysis? (In that case, you can calculate both separately and then add the displacements in the post-processing stage because both analysis are linear. There is function for that in the post-process). Adding a static load in a RS analysis doesn’t make sense for me as the Response spectrum analysis is a dynamic analysis… or are you talking about pre-stressing a structure before doing the RS analysis (there’s probably a way to do that too)? Sorry for the confusion, I hope my answer gives you at least some orientation to try to solve your problem. Btw when you apply the RS but not considering the vertical loads that make your structure less rigid, thats why I wanted to add the loads. Thank you so much for your great article. I need a little explanation on Global and local mode shape. What factor does influence the mode shape? In my analysis of complex structure in one direction, the global mode having high and local is low but the other side is reversed. Very nice Article but I have one question Left. Imagine i have a bar, which is clamped in on one side..
Now i calculate his frequeny for a longitudinal swinging.. In the nex step i wanna put a pressure on the free tip of the bar, the bar get shortened and the frequency of the longitudinal wave should get higher, so how would you calculate that? That’s a very good question. You can do such simulation by considering the pressure like some sort of pre-tension. There are ways to couple a pre-tension analysis with a modal analysis. Indeed ! Its a wonderful work for us beginners. But I would ask a little stupid question , what are these modes? Please , clarify it in the simplest of your terms that you are best at , Sir! Further I would be pleased if you write an elaborated article regarding modes , mode shapes and all these mode including stuffs. They confuse me a lot. Assume I am a dumb! A mode is a certain shape in which the model deforms at a certain natural frequency. For example, if your model has 3 natural frequencies 20Hz, 40Hz and 60Hz it vibrates in a different way at each of those frequencies. If you excite it at 20Hz with a load that excites the natural frequency, model will start to vibrate and take the deformed shape of the corresponding “20Hz Mode”. Now , I got it. Can you please write an article about Harmonic Response Analysis and also random vibration analysis in ANSYS? or just briefly describe the both. So in this case is local modes crucial or we do not consider them in analysis? For example of a constrainted structure, I have a target frequency of <35Hz, from simulation I obtained 1st local mode at 11Hz and 1st Global mode at 36Hz. Even though I met the target with the global mode, do I need to improve the local mode? I guess it depends if your local mode vibrates with the same orientation than your loading or not and if yes, how much it vibrates. If your main dynamic loading condition only excites the global mode but not the local mode (for example, if you have a load always oriented in X direction, but local mode can only be excited by a load oriented in Y direction, it will never be excited, right?). Frequency output in a mechanical system , where I ran modal analysis is 8 rigid modes and in mode 2 frequency is zero ,what’s the reason for 0 Hz and 8 rigid body modes. When you get rigid modes, It means your model is not well constrained in one direction. does changing the mesh size change the natural frequency obtained as output from the modal analysis? Can you help me with this? Is it correct the procedure? I have a question about modal analysis. I modal analysis we can do analysis of a structure in mode free-free and clamped-free. I want to know the difference between those types and where we can use them. Thanks for the article it helped me lot to know more about FEA. My question is, for the simple analysis as you explained in video, why we get the 10 modes of natural frequencies ??? As you said if we avoid the system from Resonance i,e lesser than natural frequency(1st mode) then the system is Safe.Now, what’s the importance of the reaming modes in the list you show above. i am little confused about this when we made the system safe(below natural frequency) but why the analysis tool showing the other modes also…..
Modal analysis indicated all the possible vibrations modes of your system, but it doesn’t mean that all those modes are important. You have have to understand which of those modes are really excited under normal operation conditions. Suppose that your system has Mode 1, 2 3 and 4. Mode 1 and 3 appear only for a load vibrating in X direction in a certain frequency range. Mode 2 and 4 appear only for a load vibrating in Y direction in a another certain frequency range. Now look at your operation conditions and if the only possible vibration is a vibration in X direction, you can already eliminate Mode 2 and 4. Now check the operation frequency range and check if one of the Mode 1 or 3 can appear in this range. If no, you are safe, if yes, then you should find a way to move the dangerous mode in a frequency which is not dangerous. Makes sense? Thanks for your efforts while writing the article first. I enjoyed reading it and I found out many things. My question is actually about the natural frequency of the structure. I know that the natural frequency is related to stiffness and mass. When I change the mass of the structure, let us say I made an optimization on mass and I have decreased it. What should I expect in the natural frequency of the structure? According to theory, I am expecting that the natural frequency of the structure increase. Am I right? but when I made a modal analysis on basic plate geometry, I see some of the mode increase and some of modes decrease? What is the main reason that I missed in this result? Normally, all modes should increase. My last question is about the force applying in modal analysis. In some of the modal analysis, the force is being applied as pre-tension. I realized that it is possible to get 2 different modes results in both cases. but we know from theory that forces should not affect the natural frequency of the structure. Why we get different frequency results in both cases? When should I consider the force as pre-tension in a modal analysis? Thanks in advance for your assessments.